Going to a Kinetic Sculpture Race? Great! Will you be wearing silly clothes? Fabulous! If you’re lacking inspiration, this guide will help you plan your outfit. If you’re not familiar with kinetic sculpture racing, you’re missing out! Giant human-powered sculptures lurch across land, sea, mud, sand and the occassional ice rink! Some races are really races, some are more like parades, but all are great fun and you should go at least once! Don’t forget your camera. You can find kinetic sculpture races in Northern California, Maryland, and various other domestic and international locations. Wear something absurd! 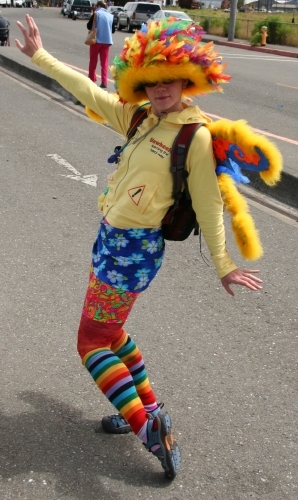 Onlookers wear all sorts of goofy outfits, and you should too! That sequined dress you’ve always wanted! Wings! Some purveyors of fairy and pixie wings are How Cool, The Butterfly Source, and Fairy Love. You can also make your own! I made the pair I’m wearing in the photo on this page using coat hangers, white tights, acrylic paint, and feather boas. At least wear a goofy hat. If you don’t even have a goofy hat, your life is sadly in need of enrichment, so it’s well worth the investment to buy one or produce one. If you find yourself with more festive garb than you can wear, bring it along and festoon spectators who aren’t with the program! Don’t forget accessories! If you don’t have time to put together silly clothes, accessories can go a long way to give your boring clothes an aura of festivity! Craft stores like Michael’s have feather boas in a nice selection of bright colors. Party stores carry cheap sunglasses which are most festive! The KineticBaltimore.com crew sports winged glasses from Party City. Party stores carry bright colored plastic hats and leis for luau parties. Target has silly things in their hair ornament selection. Look for The Great Pretend-Ear headbands with wings and ears. Look for pony tail holders with big flowers and other festivity on them. Some are stretchy enough to be used as bracelets. MTCoffinz has beautiful hair falls as well as punky mini skirts. The Oriental Trading Company sells all manner of silliness, usually by the dozen, but it’s cheap, so go ahead, get 12 rubber animal noses and hand them out to other spectators! Magic Makers has all sorts of costume accessories: wings, animal noses, ears, feather boas, wigs, tiaras. Thift stores have a great selection of silk and satiny handkerchiefs in an astounding array of colors and patterns. These can be tied to you, peek out of pockets and be sewn to clothes. They also have a selection of bright-colored swimming trunks which can be worn over bike shorts or running tights to make them more interesting. We Love Colors has tights, socks, ties, tshirts and mini dresses in 40 really exciting colors and several even more exciting tie-dyes. Parasols by Tamie and Umbrella Heavenhave fun sun shades. Whiplash Workshop carries colorful vintage attire. Straw hats are easy to find and easy to make silly! Get a can of bright colored spray paint and one of clear from Home Depot or a craft store, apply a few coats of color and a few coats of clear paint, then hang small somethings from the brim all the way around. Candidates include pom poms, small toys, bright buttons, rubber chickens or even scrunched-up balls of bright colored paper. Visit Target or a dollar store to find great stuff to hang from your hat. For more festivity, wrap tinsel around the top or attach a conical party hat or other ornament! You’ll find a gallery of festive spectators at KineticBatimore.com. This entry was posted in Kinetics by Karen. Bookmark the permalink.